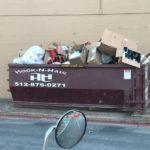 You may be thinking that you can pretty much throw anything away in your dumpster rental but like there are rules of what you can and can’t throw in your residential trashcan there are rules what is and isn’t ok to throw in a dumpster rental. We understand this may be a bit confusing, but these rules are in place for different reasons as well as local regulations to keep everyone safe. If you are unsure of an item, please feel free to contact us, and we can help you determine if the item is allowed or not. Below are a few rules of what is and isn’t allowed. What Can I Throw Away In a Dumpster? Whether you are cleaning out your garage or doing a small renovation most of these things are allowed to be thrown away in our dumpsters. 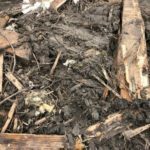 Any nonhazardous waste, wood, trash, furniture, roofing shingles, siding, and other construction /demolition debris is allowed. For more information feel free to contact us for the okay. 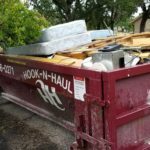 Renting the right size dumpster is key to not overloading your rental. 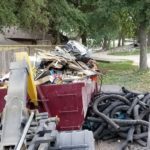 Not only will overloading your dumpster result in extra fines but it is unsafe for our drivers to remove it from our property when debris is over the tops of the dumpster walls. This is a safety issue for the driver and to everyone near the dumpster in transportation. If you are unsure of the right size dumpster for your project, please inform us of what type of job you have planned and we will suggest the right size dumpster, so you’re not overloading the dumpster like the pictures below. Just like we don’t want your overfill your dumpster, we don’t want your overload it. 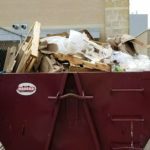 Each dumpster had a maximum weight limit, and those limits are in place to keep everyone safe. 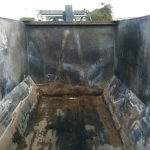 If you overload your dumpster with dirt, concrete, or other debris like in the pictures below our drivers will not be able to remove that dumpster from your property. Please ask questions on what the weight limit is for the dumpster size you, so removal goes smoothly for you and the driver. 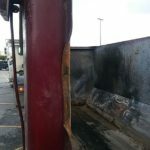 Starting fires in your dumpster result in damage which will result in your paying fines and possibly being fined by the city as well depending on local and state laws on burning debris in your neighborhood. You might think that since the fire is in a contained area, it won’t spread but that is far from the truth, not only are you putting yourself in danger but everyone else around you too. 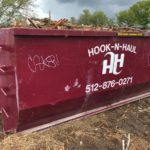 When scheduling a dumpster rental, it is best to have a good stop picked out that will be out of the way from the moment it is dropped off to pick up. 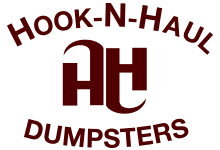 Our dumpsters are designed to be moved only by our hook and lift system. 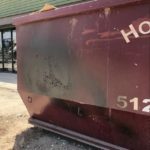 Attempting to move a dumpster on your own will result in damage to the dumpster which will, unfortunately, result in fines that nobody wants to pay. 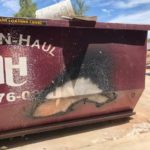 Damage to these dumpsters may look minimal, but the damage produced them not to work correctly or safely. We understand you might be a bit confused on what you can and can’t throw away in your rental and we want to make your rental experience easy, so please feel free to contact us at any time with any questions you may have. 1 What Can I Throw Away In a Dumpster?